2nd Annual Stocking Stuffer Christmas Offer! Okay, we know that it is not even Thanksgiving yet, but we also know that if you don't get a head start on your Christmas gift buying, time can get away from you. And wouldn't it be nice if some of those gifts under the Christmas tree had an educational benefit. We have a few Christmas packages that are sure to delight both the student and the teacher of the family. Stocking Stuffer Christmas Offers, which include Prismacolor pencils, metallic gel pens, moldable erasers and more, are good until December 31st, 2005. And if you order $40 or more in products before November 30th, you will receive free shipping to anywhere in the United States. Of course, there are no guarantees with the postal service, but this should mean that your package arrives before Christmas! Give the gift of time this holiday season. Give your child the gift that will become a keepsake when the rest of the school books and projects are long since a memory. Special Christmas Offer: receive a free set of gold and silver gel pens ($4.40 value) when you purchase the Wonders of Old Timeline Book or Wonders of Old on CD-ROM. This makes a truly delightful gift for anyone who is struggling to put together a cohesive timeline of events. To read review, click here. Have you been thinking about purchasing this extraordinary collection of timeline figures from Homeschool in the Woods? This is the perfect companion to the timeline book Wonders of Old above. 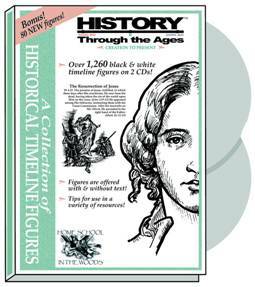 This collection contains over 1,260 black and white timeline figures on 2 CD-ROMs. It is packed with beautifully realistic drawings which can be printed along with their captions or by themselves. Special Christmas Offer: Purchase this Collection of Historical Timeline Figures before December 31st and receive a 12 pack of Verithin pencils ($6.84 value). This collection of historical biographies geared toward 8-14 year olds presents the lives of ordinary people who accomplished extraordinary deeds during the time of the Middle Ages. Illustrated with stunning portraits, this inspiring compilation of stories describes with historical accuracy and age-appropriate content the quality character and unbending determination of St. Patrick, Empress Theodora, Alcuin, Duke Wenceslas, Eleanor of Aquitaine, Joan of Arc, Johannes Gutenberg and Martin Luther. Using Tapestry of Grace? New this year, purchase either MapAids Year 1 or Year 2 and receive a large kneaded eraser. This popular eraser kneads easily into any shape, erases cleanly, and picks up all residue. Read more about the advantages of using this customized CD with your Tapestry of Grace curriculum here. Over 280 maps are contained on this 2 CD-ROM set! Our most popular sellers! Purchase both map CD-ROMs and receive a set of 6 Prismacolor pencils! ($7.95 value). 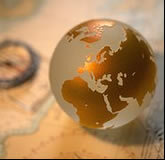 Click here to read a thorough review of Blackline Maps of World History. Also, download our free World History Map Sampler here to get an idea of what is included on these CDs. Purchase all four wall timelines spanning from 5000BC to the present and save $12 and receive a set of pastel gel pens ($5.99 value)! Our 10ft wall timelines are newly revised to accommodate even more information. All wall timelines come with over 150 timeline category stickers.